Because green is finally back – its time to save a little green too! 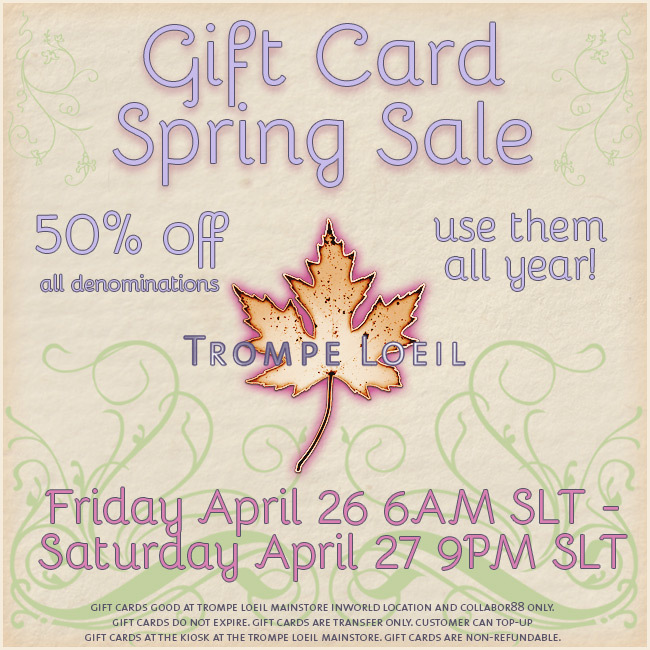 Starting at 6AM SLT on Friday, April 26, save 50% off all Trompe Loeil Gift Cards! Sale runs until Saturday, April 27, at 9PM SLT. Trompe Loeil Gift Cards are good on any vendored item at the Trompe Loeil Mainstore inworld and at Collabor88 (excluding gatcha boards) – furniture, adult items, prefabs, skyboxes, landscaping items, you name it! Trompe Loeil Gift Cards are transfer-only, which means they’re great as gifts – stock up now and use them for birthdays, holidays, or just treating yourself all year. Freshen up your spring decor with 50% off our versatile Gift Cards – spend them now on our latest items, or save them for future must-have purchases…its up to you! See you Friday!